The interest that SERC Chile’s seminar “Next Generation Power Electronics for Photovoltaic Energy Systems” aroused has motivated the organizers to think about long-term projection. “The success was such that we plan to transform it into a seminar with a certain periodicity and of greater size, that it travels through the country and that it changes annually from thematic focus , in order to expand the scope of the seminar, ” says Dr. Samir Kouro, leader of Line 5 of SERC Chile. This series of “Next Generation Seminars” will continue at the end of this year, with a meeting that will not only summon the academy and the scientific world, but will also add topics of interest to the Chilean solar industry. The “Next Generation Power Electronics for Photovoltaic Energy Systems”, carried out by SERC Chile with the collaboration of the AC3E, was held on December 12th and 13th at the Atton Hotel in Viña del Mar and focused on solar energy conversion systems, its connection to the grid and long distance electrical energy transmission systems. 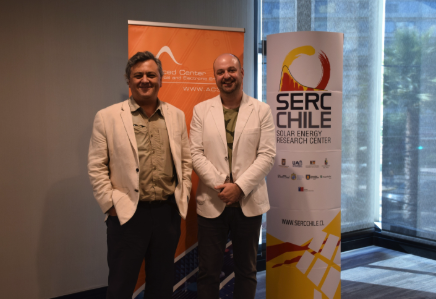 During the opening ceremony, the director of SERC Chile Rodrigo Palma stressed the importance of supporting this type of initiative. “Photovoltaic energy is an important issue at the national level, given its tremendous potential in Chile and the tremendous opportunities and impact for the country. In addition, power electronics is an area of ​​great relevance for SERC and seminars such as this allow us to provide information on what is being done in research to the public sector, industry and academia, generating meeting spaces and working networks between the different sectors of the economy,” he said. The seminar featured plenary talks by leading national and international speakers: Tomislav Dragicevic from Aalborg University, Denmark; Michael Merlin of the University of Edinburgh; Mauricio Troviano of the National University of Comahue, Argentina; Patricio Mendoza from the University of Chile; Javier Riedemann of the Pontifical Catholic University of Valparaíso; Marcelo Pérez and Samir Kouro from SERC; Andrii Chub from SERC Chile; Carlos Restrepo from the University of Talca; Rubén Peña from the University of Concepción and Kalyan K. Sen from Sen Engineering Solutions Inc., USA.